After three days of play at the Crown Poker Room in Melbourne Australia we were left with an Aussie final table that included two female players, in addition to one of poker’s young guns, James Obst. As players began to be eliminated the tournament came down to just two players, unknown Martin Kozlov against rising stars James Obst, who was in search of his first major tournament victory. Obst held a 5-1 chip lead as heads-up play began, but Kozlov was able to battle his way back into contention when he managed a timely double through with pocket Aces. With their chip stacks nearly even it was left to fate to decide the winner, as all the money went in pre-flop with Kozlov holding pocket 9’s against Obst’s AK. The board ran out: J-5-3-6-4 and Kozlov, who started the hand with slightly more chips than Obst, raised his hands in victory; as the new PokerStars ANZPT Melbourne champion. Meanwhile Obst is still in search of his first major tournament victory. 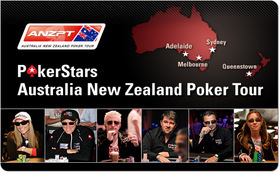 If your looking to play the ANZPT next year, get over to PokerStars and start playing there quilifiers. This entry was posted on Monday, October 11th, 2010 at 11:41 am and is filed under Poker News. You can follow any responses to this entry through the RSS 2.0 feed. You can leave a response, or trackback from your own site.